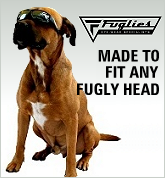 Designed, manufactured and supplied specifically for Australia's ADF, the Fuglies ADF range of sunglasses conform to ASOD as well as the civilian AS/NZS1337 standard. All models come in impact-resistant, lightweight matte black polycarbonate frames, smoke tinted UV400 rated polycarbonate safety lenses, and a removable and adjustable strap . 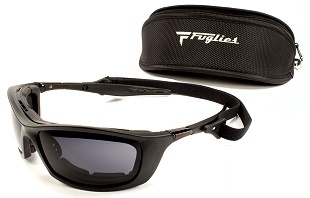 The lenses of the smoke tinted Fuglies Goggles, SAS Ballistic and ADF Ballistics (ADF8 model) are also polarised for improved glare reduction. Same great quality, same great price, but modified to ADF specifications... and they float! 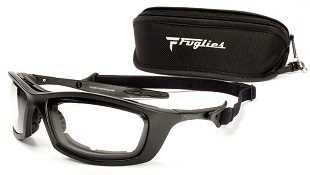 Our premium frame with padded nose grip, removeable foam lens gasket, removeable adjustable strap, and lenses impact rated to a massive 205m/s - conforms to ANSI Z87.1 and US military MIL-PRF-31013 standards. Polarised UV400 Polycarbonate - Fog dispersing inner coating and hardened scratch resistant surface. Designed specifically for breach entry work. 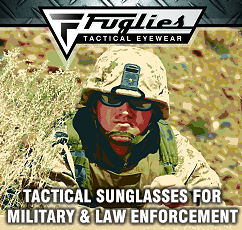 Our premium frame with padded nose grip, removable foam lens gasket, removeable adjustable strap, and lenses impact rated to a massive 205m/s - conforms to ANSI Z87.1 and US military MIL-PRF-31013 (MIL-STD-662) standards. UV400 Polycarbonate - Fog dispersing inner coating and hardened scratch resistant surface. The military version of our Mongrel frame - matte black polycarbonate frame, ballistic impact (205m/s) rated polarised lenses, adjustable nosepiece, removable adjustable lanyard strap, 2 removable inter-changable foam gaskets, and rigid carry case. Conforms to ANSI Z87.1 and US military MIL-PRF-31013 standards. Matte black polycarbonate, adjustable nosepiece, lanyard strap and removable foam gaskets. Comes with a rigid case, cleaning cloth and 2 interchangeable vented foam gaskets - our standard 4mm EVA foam gasket plus our new 9mm face-hugging foam rubber gasket. Smoke tinted polarised shatterproof safety lenses in a lightweight and fully vented polycarbonate frame with a face-hugging inner EVA foam gasket. Slimline frame design based on a standard sunglass profile for a very compact style of goggle that easily fits under the brow of a helmet. Waterproof construction, scratch resistant outer lens coating and a hydrophobic inner lens coating. Dust-proof, impact resistant and they float! 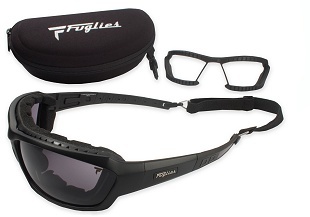 Matte black non-reflective polycarbonate frame with inner foam gasket and adjustable strap. Fully vented, waterproof, dustproof and impact resistant. A Word About Floating: Yes, they float, but it's mainly the foam gasket that makes that happen. Also, while fully waterproof and great for watersports, the foam will become waterlogged after about 45 minutes of full immersion. The basic deal is that if you're wearing them in, on or around the water, if you drop them in the water you've got heaps of time to retrieve them (unless they float away), but don't expect them to float with the bits that make them float removed, or to be able to float forever. Just thought we'd let you know. Rugged black cordura belt-case with nylon zip, webbing belt loops, swivelling snap clip, and a soft inner lining. Rigid carry case with nylon fabric outer, soft flocked inner lining, heavy duty nylon zip, and swivelling snap clip.